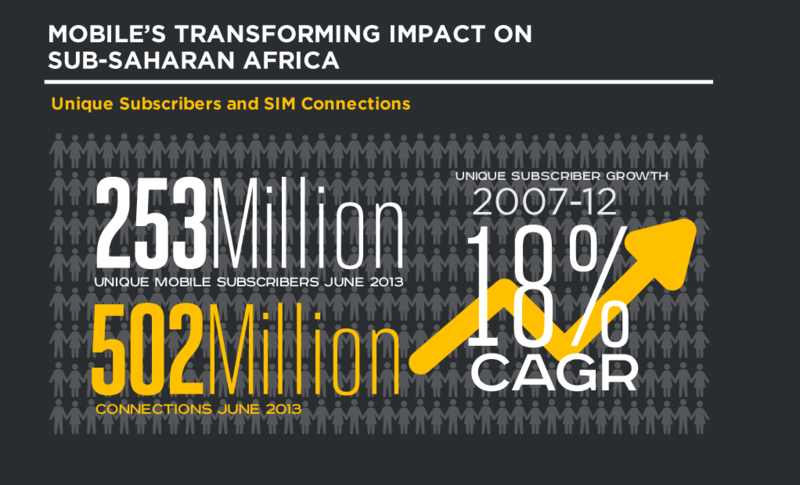 Sub-Saharan Africa has experienced a significant impact from the region’s mobile industry. A study by GMSA shows that the region’s mobile sector is set to facilitate the realization of greater potential in addressing socio-economic challenges. Currently the mobile sector supports 3.3 million jobs and is projected to double this number by 2020. The sector caters for a unique subscriber base with 253 million unique mobile users compared to 5% fixed line penetration rates. Internet connections across the region also depends largely on mobile devices with 86% of these connections being made via 2G technologies. Mobile devices have largely contributed to the campaign for financial inclusion in the region. As a result 56.9 million subscribers are now registered users of mobile money solutions. The region’s economy has been impacted by mAgriculture which now support one of the largest economic sectors; mHealth solutions have empowered citizens to get easier access to local healthcare services. To realize long-term potential in the region’s mobile industry, there is need for leaders to create a transparent policy environment for operators and investors in the sector. This will help meet the demand for higher speed connectivity and coverage in remote areas. The report highlights three policy areas on which the future of mobile industry depends: spectrum management, spectrum harmonization and taxation. Many existing spectrum licences will be up for renewal across the region. Priority should be given to operators who have demonstrated efficient use of the spectrum. This way, the process matches the socio-economic impacts with capital expenditure required to deploy advanced networks. With a transparent and predictable renewal process, regulators will be able to attract investment and recover administrative costs. Governments across the region still have a lot of ground to cover in the allocation of harmonized spectrum. The importance of this exercise is already appreciated by some governments with efforts being made to accelerate the switch to digital television. Freeing up the Digital Dividend spectrum bands (700MHz and 800MHz) for mobile broadband, business in the region will enjoy better connectivity subsequently driving economic growth. It is projected that 16 million jobs will be created between 2015 and 2020 as a result of this growth. Ownership of mobile devices in the region is however affected by high taxation rates. Adoption of new mobile services can be encouraged by lowering the cost of mobile ownership. Many states in Sub-Saharan Africa currently charge custom duties on mobile handsets, in some cases over 30% is charged pushing the cost higher for prospective mobile users. Long term benefits of lower tax levels include a higher GDP, improved productivity and greater tax revenues. “The mobile industry has greatly transformed the social and economic sectors of Sub-Saharan Africa but there is scope for far greater growth and innovation, if the right conditions are established. In addressing key regulatory concerns, policy makers throughout the region have a major opportunity to unlock the potential of a dynamic and interconnected Africa,” says GSMA’s Tom Phillips.